Opening round of the 2017 Stock Car race season, the Autodromo de Goiania, received the category return this Sunday (19th) for the 11th and penultimate event of the championship. Eurofarma-RC driver Daniel Serra raises his advantage from 10 to 19 points compared to Thiago Camilo, while Atila Abreu declares his love for the race track of Goiania. But the sensation of this penultimate round was Portuguese Antonio Feliz da Costa gives for the team Motorsporte Hero, his first podium in Stock Car. Starting the race in pole position, Daniel Serra wins for the second time in Goiania this season. In the second race of the day Atila Abreu benefited with a grid start inversion, and conquered his second victory of the year. What happened was practically a replay of the last April's race with Daniel Serra starting from pole and winning the race. The second position was taken by the fourth in the starting grid, Ricardo Zonta, followed by the Portuguese Antonio Felix da Costa, who in third position competed in the Goiania round from the invitation of Motorsporte Hero. 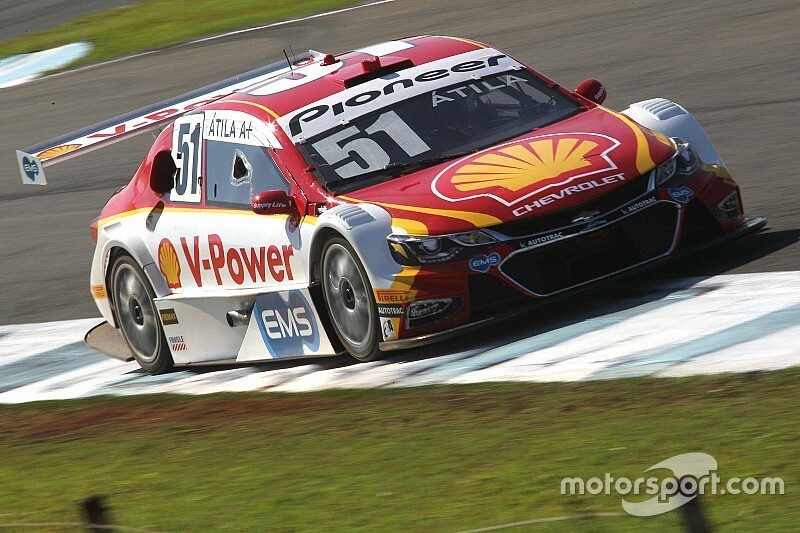 Championship vice-leader and Daniel Serra's main rival in the fight for the title, Thiago Camilo, dropped from the fifth position and crossed the finish line in eight. Goiania's tenth place of the first race, Attila Abreu started from pole in race 1 thanks to the top ten position inversions to the grid of the second race and won from end to end to the second race of the 11th and penultimate round of the 2017 Stock Car Brazil Season. The second position was with 2010 Stock Car season champion Max Wilson, followed by Caca Bueno, who finished in third place. Championship Leader and the first race winner of the the day, Daniel Serra crossed the finish line in ninth place.